Duane syndrome (DS), also known as Duane retraction syndrome (DRS), is a rare, congenital disorder of eye movement. Most individuals with Duane syndrome are diagnosed by age 10 years. The six muscles that control eye movement are attached to the outside of the wall of the eye. In each eye, two muscles move the eye horizontally. The lateral rectus muscle pulls the eye out, toward the ear, and the medial rectus muscle pulls the eye in, toward the nose. Four other muscles move the eye up or down and at an angle. Each eye muscle receives the command for movement from cranial nerves that exit the brain. Duane syndrome (DS) is a miswiring of the eye muscles that causes some eye muscles to contract when they should not and other eye muscles not to contract when they should. People with Duane syndrome have a limited and sometimes absent ability to move their eye outward toward the ear (ie, abduction), and in most cases, they have a limited ability to move the eye inward toward the nose (ie, adduction). This probably occurs around the sixth week of pregnancy and is due to poor development of tiny parts of the brainstem that control the eye muscles. In Duane syndrome, the sixth cranial nerve that controls the lateral rectus muscle (the muscle that rotates the eye out toward the ear) does not develop properly. Why the nerve does not develop is not yet understood. Thus, the problem is not primarily with the eye muscle itself but with the nerve that transmits the electrical impulses to the muscle. There is also irregular innervation of a branch from the third cranial nerve, which controls the medial rectus muscle (the muscle that rotates the eye toward the nose). This is why abnormalities may be found in both left gaze and right gaze. Often, when the eye moves toward the nose, the eyeball also pulls into the socket (ie, retraction), and the eye opening narrows. In some cases, the eye moves upward or downward. Many patients with Duane syndrome develop a habit of turning their face to maintain binocular vision and thus compensate for improper turning of the eyes. In about 80% of all cases of Duane syndrome, only one eye is affected, most often the left eye. However, in some cases, both eyes are affected; usually, one eye is affected more than the other. See the image below. An individual diagnosed with Duane syndrome in the left eye. In this image, the affected person is attempting to look far right. Notice the afflicted left eye faces straight and up (an "upshoot"), rather than following the right eye to the right. Sinclair (in 1895), Bahr (in 1896), Stilling (in 1887), Turk (in 1899), and Wolff (in 1900) first described Duane retraction syndrome (DRS). [1, 2, 3, 4, 5] In 1905, Duane reported 54 cases, summarizing all the clinical findings, reviewing previous work, and offering theories on the pathogenesis and treatment of the disease. See the image below. Brown classified the condition into 3 subtypes, based upon clinical observations. Type A corresponded to limited abduction and less limited adduction (as described originally by Duane). Type B corresponded to limited abduction but normal adduction. Type C corresponded to limitation of adduction that is greater than limitation of abduction, giving rise to a divergent deviation and a head posture in which the face is turned away from the side of the affected eye. In 1974, with the support of electromyography (EMG) and following the suggestions of Lyle and Malbran, Huber classified Duane syndrome into the 3 types: Duane 1, Duane 2, and Duane 3. 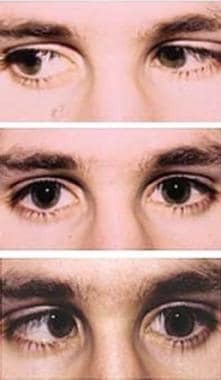 [8, 9, 10] Type 1 is marked limitation of abduction (corresponds to Type B in Brown's classification) explicable by maximum innervation reaching the lateral rectus muscle only when the affected eye is adducted. Type 2 is limitation of adduction (corresponds to Type C in Brown’s classification), which Huber explains as being caused by co-innervation of both medial and lateral rectus muscles on attempted adduction. Type 3 is limitation of both adduction and abduction (corresponds to Type A in Brown’s classification), which Huber explains as being due to co-contraction, accompanied by a loss of innervation to the lateral rectus muscle on attempted abduction. Duane syndrome is a congenital ocular motility disorder characterized by limited abduction and/or limited adduction. The palpebral fissure narrows (ie, the globe retracts) on attempted adduction. Upward or downward deviation may occur with attempted adduction because of a leash effect. Often associated with this condition is a tether phenomenon consisting of overelevation, overdepression, or both during adduction as the retracted globe escapes from its horizontal rectus restrictions. It is a condition of aberrant innervation that results in co-contraction of the medial and lateral recti in the affected eye. Therefore, Duane syndrome can be considered to be congenital miswiring of the medial and the lateral rectus muscles such that globe retraction occurs on adduction. Findings from neuropathologic, neuroradiologic, and neurophysiologic studies support the hypothesis that Duane syndrome results from an absence of cranial nerve VI (abducens nerve). Neuropathologic evidence comes from postmortem examinations of individuals who had Duane syndrome. These studies have shown an absence of cranial nerve VI and its corresponding alpha motor neurons in the pons, as well as aberrant innervation of the lateral rectus muscle by a branch of cranial nerve III. MRI studies of an individual with Duane syndrome also revealed the absence of the abducens nerve. Neurophysiologic evidence of neuronal involvement in Duane syndrome is derived from EMG studies, which show that the medial and lateral recti muscles are electrically active in individuals with Duane syndrome. However, when individuals with Duane syndrome attempt to move their eyes inward (ie, adduct it), both of these muscles contract at the same time, causing the eyeball to retract inward and the eye opening (palpebral fissure) to become narrowed. These findings support aberrant innervation of the lateral rectus muscle. Autopsy specimens have shown agenesis of the sixth nerve nucleus and innervation of the lateral rectus muscle by the third nerve nucleus. This observation explains the globe retraction on attempted adduction. In neuropathologic terms, the cause of Duane syndrome is an absent sixth nerve nucleus and innervation of the lateral rectus by a branch of the inferior division of the third nerve. Condensation of the mesoderm around the eye results in development of the extrinsic eye muscles. When the embryo is 7 mm long, they form 1 mass, which is supplied by only the third nerve. When the embryo is 8-12 mm long, that is, when the fourth nerve and the sixth nerve arrive, this mass divides into separate muscles. Because of an absence of or an aplasia of the abducens nerve, a branch of the oculomotor nerve (as a substitute) conceivably enters the part of the muscle mass that is to become the lateral rectus muscle. Given the evidence that Duane syndrome results from an absence of the abducens nerve (cranial nerve VI) and that Duane syndrome is associated with other anomalies in some cases, Duane syndrome is thought to reflect a disturbance of normal embryonic development. Either a genetic factor or an environmental factor may be involved when the cranial nerves and ocular muscles are developing at 3-8 weeks of gestation. The association of Duane syndrome with other ocular anomalies and congenital facial, skeletal, or neural abnormalities in 30-50% of patients further substantiates the hypothesis of disturbed embryogenesis. A teratogenic event during the second month of gestation seems to cause most ocular and extraocular abnormalities observed in combination with Duane syndrome. Duane syndrome is present from birth, even if it is not recognized during infancy. An abnormal head posture and strabismus are often visible in old photographs taken in early childhood. Both genetic factors and environmental factors are likely to play a role in the development of Duane syndrome. Most cases of Duane syndrome cases are sporadic, with only approximately 2%-5% of patients having a familial pattern; families with large involvement are rarely reported. Both dominant forms and recessive forms of Duane syndrome have been documented. In some families with dominant Duane syndrome, the disease skips a generation (reduced penetrance) and ranges in severity (variable expressivity). Most familial cases are not associated with other anomalies. Genetic linkage studies of a large family with Duane syndrome established the location of a Duane syndrome gene on chromosome 2. Although a genetic cause of Duane syndrome has long been accepted, these studies were the first to show a statistically significant linkage. In addition, cytogenetic results of individuals with Duane syndrome have shown, in rare cases, abnormalities that suggest the contribution of more than 1 gene. Deletions on chromosomes 4 and 8 and an extra marker chromosome thought to be derived from chromosome 22 have been documented in individuals with Duane syndrome. Familial occurrence with dominant inheritance patterns has been reported. Duane syndrome has also been described in monozygotic twins. However, most cases are sporadic rather than familial. Pairs of identical twins with mirror-image Duane syndrome have been described. Its most common variant (type 1, 85%) and most commonly manifests in the left eye (60%) and in girls (60%) as severely limited or absent abduction. In 90% of cases, the patient has no family history of Duane syndrome. Ten percent of patients will have an affected family member, and these tend to be cases where both eyes are involved. There is currently no test that can determine whether a patient has a hereditary form. See also the Causes section. The frequency of Duane syndrome in the general population of individuals with eye movement disorders (strabismus) is approximately 1%-5%. The most common clinical presentation is type 1 Duane syndrome (70%-80%), followed by type 2 (7%) and type 3 (15%). Involvement of both eyes is less common than involvement of one eye only. Approximately 80% of cases are unilateral. Of the unilateral cases, the left eye is most often affected (60%-72%). Duane syndrome accounts for 1% of all cases of strabismus. 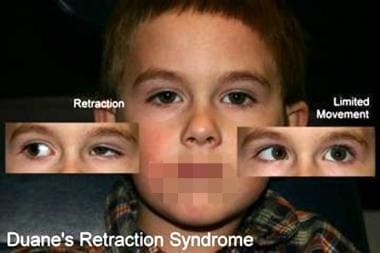 Unilateral retraction syndrome is the rule; the left eye is distinctly involved in 60% of cases, the right eye is involved in 20% of cases, and both eyes are involved in 20% of cases. About 40% of patients with Duane syndrome develop esotropia and tight medial rectus muscles; therefore, they adopt a head turn toward the eye to maintain single binocular vision, or they maintain a straight head but accept esotropia, abnormal retinal correspondence (ARC), and suppression, if available. Duane syndrome has no reported racial preference. The female-to-male ratio is 3:2, but this female predominance is not understood. Duane syndrome is a congenital anomaly. Most cases are diagnosed by age 10 years. Duane syndrome represents a spectrum of motility disorders in which the common feature is retraction of the affected eye on attempted adduction. Electrophysiologic and neuropathologic studies have shown that the underlying cause is anomalous innervation of the lateral rectus with the medial rectus and, at times, with vertical muscles in the affected eye. Clinical abnormalities observed in Duane syndrome can include any or all of the following: a deviation in the primary position; abnormal head position; severe retraction causing a pseudoptosis; and upshoots and/or downshoots associated with A, V, or X patterns. A surgical approach based on the analysis of these four features is presented, allowing the surgeon to devise an appropriate, individualized plan for a given case, which can yield optimal results in one operation. This disorder consists of deficient horizontal eye movements, eyelid retraction, palpebral fissure narrowing, and abnormal vertical eye movements. Most cases are sporadic and unilateral (usually left side) with a slight female predominance. Several associated ocular and systemic conditions have been described in patients with Duane syndrome. In most cases, the abducens nucleus and nerve are absent or hypoplastic, and the lateral rectus muscle is innervated by a branch of the oculomotor nerve. However, there may be contributing mechanical abnormalities. Type I Duane syndrome (primary gaze position esotropia with limitation of abduction) comprises most cases. Approximately 50% of patients with type I Duane syndrome are orthophoric in primary gaze. Esotropia is the most common type of strabismus encountered, and characteristic upshoots and downshoots occur in adduction. Surgical intervention has gradually become more popular in order to improve the primary gaze alignment and mitigate some of the associated abnormalities in ocular motility. However, patients are rarely rendered clinically healthy, and limited expectations are appropriate. Sinclair WW. Abnormal associated movements of the eyelids. Ophthalmol Rev. 1895. 14:307. Bahr K. Vorstellung eines Falles von eigenartiger Muskelanomalie eines Auges Ber Dtsch. Ges Opthalmol. 1896. 25:334. Stilling J. Bergmann JF, ed. Untersuchungen uber die Entstehung der Kurzsichtigkeit. Wiesbaden; 1887. 13. Turk S. Bemerkungen zu einem Falle von Retraction des Auges. Cbl Pract Augenheilk. 1899. 23:14. Wolff J. The occurrences of retraction movements of the eyeball together with congenital defects in the external ocular muscles. Arch Ophthalmol. 1900. 29:297. Duane A. Congenital deficiency of abduction, associated with impairment of adduction, retraction movements, contraction of the palpebral fissure and oblique movements of the eye. 1905. Arch Ophthalmol. 1996 Oct. 114(10):1255-6; discussion 1257. [Medline]. Brown HW. Congenital structural anomalies of the muscles. Allen JH, ed. Strabismus Ophthalmic Symposium 11. St. Louis: CV Mosby Co; 1958. 391. Lyle TK, Bridgeman GJO. Worth and Chavasse’s Squint. The Binocular Reflexes and the Treatment of Strabismus. 9th ed. London: Bailliere Tindall and Cox; 1959. 251-5. Malbran J. Estrabismos y paralysis. Clinica y terapeutica, Buenos Aires. Editorial Oftalmologia. 1949. 627. Huber A. Electrophysiology of the retraction syndromes. Br J Ophthalmol. 1974 Mar. 58(3):293-300. [Medline]. Engle E. The genetics of strabismus: Duane, Moebius, and fibrosis syndromes. Traboulis E, ed. Genetic Diseases of the Eye: A Textbook and Atlas. New York: Oxford University Press; 1998. 477-512. Kekunnaya R, Gupta A, Sachdeva V, Krishnaiah S, Rao BV, Vashist U, et al. Duane Retraction Syndrome: Series of 441 Cases. J Pediatr Ophthalmol Strabismus. 2011 Nov 8. 1-6. [Medline]. Kirkham TH. Anisometropia and amblyopia in Duane's syndrome. Am J Ophthalmol. 1970 May. 69(5):774-7. [Medline]. Maruo T, Kusota N, Arimoto H, Kikuchi R. Duane’s syndrome. Jap J Ophthalmol. 1979. 23:453. Tredici TD, von Noorden GK. Are anisometropia and amblyopia common in Duane's syndrome?. J Pediatr Ophthalmol Strabismus. 1985 Jan-Feb. 22(1):23-5. [Medline]. von Noorden GK. Recession of both horizontal recti muscles in Duane's retraction syndrome with elevation and depression of the adducted eye. Am J Ophthalmol. 1992 Sep 15. 114(3):311-3. [Medline]. Duane TD, Schatz NJ, Caputo AR. Pseudo-Duane's retraction syndrome. Trans Am Ophthalmol Soc. 1977. 74:122-32. [Medline]. Hoyt WF, Nachtigaller H. Anomalies of ocular motor nerves. Neuroanatomic correlates of paradoxical innervation in Duane's syndrome and related congenital ocular motor disorders. Am J Ophthalmol. 1965 Sep. 60(3):443-8. [Medline]. Matteucci P. 1 dufetti congeniti di abduzione (congenital abduction deficiency) con particolare riguardo alla patogenesi. Rass Ital Ottallmol. 1946. 15:345. Miller NR, Kiel SM, Green WR, Clark AW. Unilateral Duane's retraction syndrome (Type 1). Arch Ophthalmol. 1982 Sep. 100(9):1468-72. [Medline]. Merino P, Merino M, Gómez De Liaño P, Blanco N. Horizontal rectus surgery in Duane syndrome. Eur J Ophthalmol. 2011 Jun 23. [Medline]. Pineles SL, Rosenbaum AL, Kekunnaya R, Velez FG. Medial rectus recession after vertical rectus transposition in patients with esotropic Duane syndrome. Arch Ophthalmol. 2011 Sep. 129(9):1195-8. [Medline]. Alexandrakis G, Saunders RA. Duane retraction syndrome. Ophthalmol Clin North Am. 2001 Sep. 14(3):407-17. [Medline]. Appukuttan B, Gillanders E, Juo SH, Freas-Lutz D, Ott S, Sood R, et al. Localization of a gene for Duane retraction syndrome to chromosome 2q31. Am J Hum Genet. 1999 Dec. 65(6):1639-46. [Medline]. Bagheri A, Repka MX. Association of Duane retraction syndrome and Brown syndrome. J Pediatr Ophthalmol Strabismus. 2005 Jul-Aug. 42(4):235-7. [Medline]. Bremer JL. Recurrent branches of abducens nerve in human embryos. Am J Anat. 1921. 28:371. Britt MT, Velez FG, Velez G, Rosenbaum AL. Vertical rectus muscle transposition for bilateral duane syndrome. J AAPOS. 2005 Oct. 9(5):416-21. [Medline]. Campos E. Strabismus and ocular motility disorders. Proceedings of the Sixth Meeting of the International Strabismological Association. Surfer's Paradise, Australia: MacMillan Press; 1990. 221-235. Carlson MR, Jampolsky A. An adjustable transposition procedure for abduction deficiencies. Am J Ophthalmol. 1979 Mar. 87(3):382-7. [Medline]. Chew CK, Foster P, Hurst JA, Salmon JF. Duane's retraction syndrome associated with chromosome 4q27-31 segment deletion. Am J Ophthalmol. 1995 Jun. 119(6):807-9. [Medline]. Chua B, Johnson K, Donaldson C, Martin F. Management of Duane retraction syndrome. J Pediatr Ophthalmol Strabismus. 2005 Jan-Feb. 42(1):13-7; quiz 45-6. [Medline]. Cross HE, Pfaffenbach DD. Duane's retraction syndrome and associated congenital malformations. Am J Ophthalmol. 1972 Mar. 73(3):442-50. [Medline]. Cullen P, Rodgers CS, Callen DF, Connolly VM, Eyre H, Fells P, et al. Association of familial Duane anomaly and urogenital abnormalities with a bisatellited marker derived from chromosome 22. Am J Med Genet. 1993 Nov 1. 47(6):925-30. [Medline]. de Decker W. Kestenbaum transposition operation for treatment of the Duane I retraction syndrome. Trans Ophthalmol Soc U K. 1980. 100(4):479-82. [Medline]. DeRespinis PA, Caputo AR, Wagner RS, Guo S. Duane's retraction syndrome. Surv Ophthalmol. 1993 Nov-Dec. 38(3):257-88. [Medline]. Diamond G. Esotropia. Yanoff M, Duker JS. Ophthalmology. Philadelphia: Mosby; 1999. 6.6.1-6.6.8. Ferrell RL, Jones B, Lucas RV Jr. Simultaneous occurrence of the Holt-Oram and the Duane syndromes. J Pediatr. 1966 Oct. 69(4):630-4. [Medline]. Glaser JS, Bachynski B. Congenital motor and sensory anomalies. Glaser JS. Neuroophthalmology. 2nd ed. Philadelphia: JB Lippincott Co; 1990. 419-435. Gobin MH. Surgical management of Duane's syndrome. Br J Ophthalmol. 1974 Mar. 58(3):301-6. [Medline]. Goldstein JH, Sacks DB. Bilateral Duane's syndrome. J Pediatr Ophthalmol. 1977 Jan-Feb. 14(1):12-7. [Medline]. Gourdeau A, Miller N, Zee D, Morris J. Central ocular motor abnormalities in Duane's retraction syndrome. Arch Ophthalmol. 1981 Oct. 99(10):1809-10. [Medline]. Hotchkiss MG, Miller NR, Clark AW, Green WR. Bilateral Duane's retraction syndrome. A clinical-pathologic case report. Arch Ophthalmol. 1980 May. 98(5):870-4. [Medline]. Isenberg S, Urist MJ. Clinical observations in 101 consecutive patients with Duane's retraction syndrome. Am J Ophthalmol. 1977 Sep. 84(3):419-25. [Medline]. Jay WM, Hoyt CS. Abnormal brain stem auditory-evoked potentials in Stilling-Turk-Duane retraction syndrome. Am J Ophthalmol. 1980 Jun. 89(6):814-8. [Medline]. Johnson LV. Adherence syndrome: Pseudoparalysis of the lateral or superior rectus muscles. Arch Ophthalmol. 1950. 44:870. Kawano K, Fujita S. Duane's retraction syndrome associated with morning glory syndrome. J Pediatr Ophthalmol Strabismus. 1981 Jan-Feb. 18(1):51-4. [Medline]. Kirkham TH. Duane's syndrome and familial perceptive deafness. Br J Ophthalmol. 1969 May. 53(5):335-9. [Medline]. Kohlhase J, Chitayat D, Kotzot D, Ceylaner S, Froster UG, Fuchs , et al. SALL4 mutations in Okihiro syndrome (Duane-radial ray syndrome), acro-renal-ocular syndrome, and related disorders. Hum Mutat. 2005 Sep. 26(3):176-83. [Medline]. Kowal VO, McKeown CA. Duane's syndrome. Int Ophthalmol Clin. 1992. 32(1):51-62. [Medline]. Kraft SP. A surgical approach for Duane syndrome. J Pediatr Ophthalmol Strabismus. 1988 May-Jun. 25(3):119-30. [Medline]. Kraft SP, O'Donoghue EP, Roarty JD. Improvement of compensatory head postures after strabismus surgery. Ophthalmology. 1992 Aug. 99(8):1301-8. [Medline]. Kruger KE. [Contribution on the etiology of the Stilling-Turk-Duane syndrome]. Acta Ophthalmol (Copenh). 1969. 47(2):415-23. [Medline]. Laughlin R. Hereditary paralysis of the abducens nerve. Am J Ophthalmol. 1937. 20:396. MacDonald AL, Crawford JS, Smith DR. Duane's Retraction Syndrome: an evaluation of the sensory status. Can J Ophthalmol. 1974 Oct. 9(4):458-62. [Medline]. Mehel E, Quere MA, Lavenant F, Pechereau A. [Epidemiological and clinical aspects of Stilling-Turk-Duane syndrome]. J Fr Ophtalmol. 1996. 19(8-9):533-42. [Medline]. Mein J, Trimble R. Diagnosis and Management of Ocular Motility Disorders. 2nd ed. Blackwells; 1991. Molarte AB, Rosenbaum AL. Vertical rectus muscle transposition surgery for Duane's syndrome. J Pediatr Ophthalmol Strabismus. 1990 Jul-Aug. 27(4):171-7. [Medline]. Morad Y, Kowal L, Scott AB. Lateral rectus muscle disinsertion and reattachment to the lateral orbital wall. Br J Ophthalmol. 2005 Aug. 89(8):983-5. [Medline]. Moster M. Paresis of isolated and multiple cranial nerves and painful ophthalmoplegia. Yanoff M, Duker JS. Ophthalmology. Philadelphia: Mosby; 1999. 11.16.1-11.16.12. Nelson LB. Severe adduction deficiency following a large medial rectus recession in Duane's retraction syndrome. Arch Ophthalmol. 1986 Jun. 104(6):859-62. [Medline]. Noel LP, Clarke WN. Adduction deficiency following medial recti recession in Duane's retraction syndrome. Case report. Arch Ophthalmol. 1987 Apr. 105(4):465. [Medline]. O'Malley ER, Helveston EM, Ellis FD. Duane's retraction syndrome -- plus. J Pediatr Ophthalmol Strabismus. 1982 May-Jun. 19(3):161-5. [Medline]. Okihiro MM, Tasaki T, Nakano KK, Bennett BK. Duane syndrome and congenital upper-limb anomalies. A familial occurrence. Arch Neurol. 1977 Mar. 34(3):174-9. [Medline]. Otradovec J. [A bilateral Duane's syndrome in a brain stem tumor]. Klin Monatsbl Augenheilkd. 1968. 153(5):686-91. [Medline]. Parsa CF, Grant E, Dillon WP Jr, du Lac S, Hoyt WF. Absence of the abducens nerve in Duane syndrome verified by magnetic resonance imaging. Am J Ophthalmol. 1998 Mar. 125(3):399-401. [Medline]. Pfaffenbach DD, Cross HE, Kearns TP. Congenital anomalies in Duane's retraction syndrome. Arch Ophthalmol. 1972 Dec. 88(6):635-9. [Medline]. Pieroni D. Goldenhar's syndrome associated with bilateral Duane's retraction syndrome. J Pediatr Ophthalmol. 1969. 6:16. Pressman SH, Scott WE. Surgical treatment of Duane's syndrome. Ophthalmology. 1986 Jan. 93(1):29-38. [Medline]. Raab EL. Clinical features of Duane's syndrome. J Pediatr Ophthalmol Strabismus. 1966. 23:64. Ramsay J, Taylor D. Congenital crocodile tears: a key to the aetiology of Duane's syndrome. Br J Ophthalmol. 1980 Jul. 64(7):518-22. [Medline]. Rhee DJ, Pyfer MF. Pediatrics: strabismus syndromes. Rhee DJ, Pyfer MF. The Wills Eye Manual: Office and Emergency Room Diagnosis and Treatment of Eye Disease. 3rd ed. Philadelphia: Lippincott Williams and Wilkins; 1999. 209-210. Ro A, Chernoff G, MacRae D, Orton RB, Cadera W. Auditory function in Duane's retraction syndrome. Am J Ophthalmol. 1990 Jan 15. 109(1):75-8. [Medline]. Rogers GL, Bremer DL. Surgical treatment of the upshoot and downshoot in Duanes' retraction syndrome. Ophthalmology. 1984 Nov. 91(11):1380-3. [Medline]. Rosenbaum AL, Weiss SJ. Monozygotic twins discordant for Duane's retraction syndrome. J Pediatr Ophthalmol Strabismus. 1978 Nov-Dec. 15(6):359-61. [Medline]. Sato S. Electromyographic studies on Duane’s retraction syndrome. Report 1. Qualitative changes of action currents of extraocular muscles in ocular movements. Acta Soc Ophthalmol Jap. 1959. 63:228. Saunders RA, Phillips MS. Anterior segment ischemia after three rectus muscle surgery. Ophthalmology. 1988 Apr. 95(4):533-7. [Medline]. Scott AB, Wong GY. Duane's syndrome. An electromyographic study. Arch Ophthalmol. 1972 Feb. 87(2):140-7. [Medline]. Shainberg M. Duane syndrome. Am Orthopt J. 2000. Sprunger DT. Recession of both horizontal rectus muscles in Duane syndrome with globe retraction in primary position. J AAPOS. 1997 Mar. 1(1):31-3. [Medline]. Strachan IM, Brown BH. Electromyography of extraocular muscles in Duane's syndrome. Br J Ophthalmol. 1972 Aug. 56(8):594-9. [Medline]. Vincent C, Kalatzis V, Compain S, Levilliers J, Slim R, Graia F, et al. A proposed new contiguous gene syndrome on 8q consists of Branchio-Oto-Renal (BOR) syndrome, Duane syndrome, a dominant form of hydrocephalus and trapeze aplasia; implications for the mapping of the BOR gene. Hum Mol Genet. 1994 Oct. 3(10):1859-66. [Medline]. von Noorden GK, Murray E. Up- and downshoot in Duane's retraction syndrome. J Pediatr Ophthalmol Strabismus. 1986 Sep-Oct. 23(5):212-5. [Medline]. Yuksel D, Optican LM, Lefevre P. Properties of saccades in duane retraction syndrome. Invest Ophthalmol Vis Sci. 2005 Sep. 46(9):3144-51. [Medline]. Zhang F. Clinical features of 201 cases with Duane's retraction syndrome. Chin Med J (Engl). 1997 Oct. 110(10):789-91. [Medline]. Table 1. Types of Duane Syndrome. Fast Five Quiz: Are You Familiar With Dry Eye Disease? Is Crosslinked Corneal Donor Tissue Beneficial in PK?